Four police personnel and three civilians including a six-year-old boy were killed and at least 26 others were injured in a suicide bombing on Tuesday afternoon in a Sheikh Zuweid market in North Sinai governorate, Egypt's interior ministry said. According to the ministry, a 15-year-old suicide bomber detonated explosives at a security checkpoint in the local market in the heart of Sheikh Zuweid city. Two police officers and two low-ranking policemen were killed in the attack. The injured have been transferred to a nearby hospital to receive treatment. Security forces from the police and Armed Forces are currently sweeping the area. The Islamic State group has claimed responsibility for the suicide bombing in a statement published online. The terrorist organisation said that the attack was revenge for recent operations against the group in Syria. 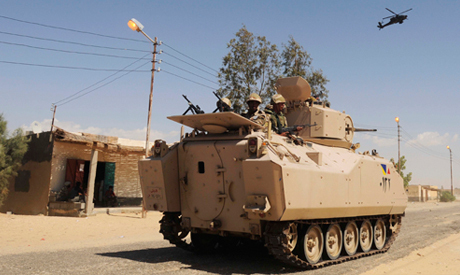 The military has been carrying out Operation Sinai 2018, a counter-terrorism campaign, since February 2018. The campaign involves land, naval and air forces, as well as the police and border guards.